In Spirit Tracks, I think the staff properly absorbed their own definitions of what Zelda is, and created new ways of playing while protecting past traditions. It’s the same with the sub player’s puzzles. 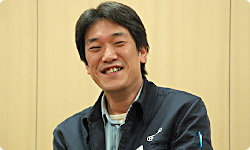 The person who thought up the sub player puzzles was another former programmer, like Director Iwamoto. The puzzles that planner thought up are games that make you use different parts of your brain than usual. 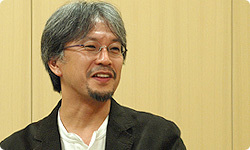 At EAD, there are lots of planners who came from Design – such as Miyamoto-san, Tezuka-san, and you, Aonuma-san – and relatively few people from Programming, aren’t there? Do you think the puzzles are different from the usual ones precisely because someone from Programming thought them up? I do. They’re clearly different. And, when I tried them, I felt, “Oh, I see! I never would have thought of this!” many, many times. And I think, once the people playing the game have solved those, they’ll be able to think, “Hey, check it out! How smart am I, huh! ?” That’s one of the best parts about the puzzles in Zelda. But they really do make you use your head in different ways. I was a Liberal Arts man, so maybe I feel it more strongly because of that. In any case, I think you can look forward to puzzles the likes of which you’ve never seen. This time, they’ve added “science” puzzles, you mean. Well now, is there anything you feel you just have to tell the players about Spirit Tracks? And actually, if you look at the registration on Club Nintendo, although the Zelda series has traditionally had more of a male audience, on the DS, it seems as though lots of women are also enjoying it. In fact, my wife’s played it all the way through to the end. She doesn’t play video games very much, but even so, she plugged away at it all by herself, all the way through. So I’d really like it if women would play this game too. When I took the game to have it play tested, I asked for “people who really weren’t acquainted with Zelda”, and they had a female staff member from the same department play it. And she wrote in her report, “I didn’t know that playing Zelda could give you such a sense of achievement. There were times when it made me want to say ‘All right! I did it!’.” Of course, she might have been saying some of it out of consideration for the staff, but still. One of Zelda’s biggest features is that great sense of achievement, and she had actually played the game when she said that; I really don’t think she was just being nice. But I hear there are a lot of female railroad fans out there. I mentioned this a little while ago, too, but I think there are some people who may feel that trains and Zelda don’t really mix. If you try it, though, you’ll see that it really is Zelda-like. It has the essence of Zelda. Yes. I think, at this point, the game couldn’t exist without that train. Also, when playing Zelda, people tend to clear one dungeon and rush straight on to the next one, playing as though speed were the important thing. I’d like them to slow down a bit; don’t rush straight through it. Take detours and side roads while you play. By taking detours, they’ll actually be able to enjoy a denser, richer Zelda. That’s right. By using the train to move around, the world just keeps expanding; they can enjoy all sorts of events in all sorts of places, and get to know more and more about that world. Actually, they’ll get to see various dramatic developments at those events. We’ve also put in a lot of elements for grown-ups, so I think women will be able to enjoy the game for that reason, too. Can I say one more thing? In the last game, we used Nintendo Wi-Fi Connection and made a complete strategy game which you played one-on-one. But then lots of players told us, “It’s too hard”. I actually battled everybody else, too, and I didn’t win much either. The mechanics of the game were incredibly fun, but it really was too hard. So this time, we made things a bit more action-oriented and created something people can really get excited about playing. This time they’ll be able to play with the people around them, right? That’s right. It uses local wireless, and up to four people can play. If one person has the Game Card, the other players can play via Download Play. So, whenever people get together, like at New Year’s, they can download it and just have fun. Basically, it’s a game where everybody tries to get the Force Gems to win, but with this particular concept, as with Mario Kart, they can get all hyper and excited as a group. So we put in lot of things where you can make a comeback with one shot, or get an item and turn the tables completely. So you send him at each other and intercept each other to get the Force Gems. That’s it. (laughs) We’ve made it a little less cerebral this time, and they can get all hyper and really have fun when they play, so I’d like them to play it with their friends. In other words, when a few people with DS systems get together, they’ve now got one more way to have fun. By the way, Aonuma-san, doesn’t this game have a really great feel to it, too? But it’s because you worked so hard during that year that it took the shape it has now.